To determine the rotational stability of the Rayner 600S intraocular lens (IOL) (Rayner, Worthing, United Kingdom) using objective image analysis techniques. A total of 66 patients (mean age: 69.92 ± 8.45 years) with healthy eyes presenting for routine cataract surgery were implanted monocularly with the 600S IOL and followed up over 90 to 180 days postoperatively. Images of the IOL were captured through a maximally dilated pupil (tropicamide 1.0%, phenylephrine 2.5%) immediately after surgery and after 1 to 3 days, 30 days, and 90 to 180 days using a digital slit-lamp biomicro-scope. The orientation of the IOL markings were image analyzed compared to conjunctival blood vessel landmarks visible across all time points to correct for head and rotation. Centration was assessed by drawing ovals to circumscribe the IOL, pupil, and limbus to compare the centers (0.01 mm per-pixel resolution). 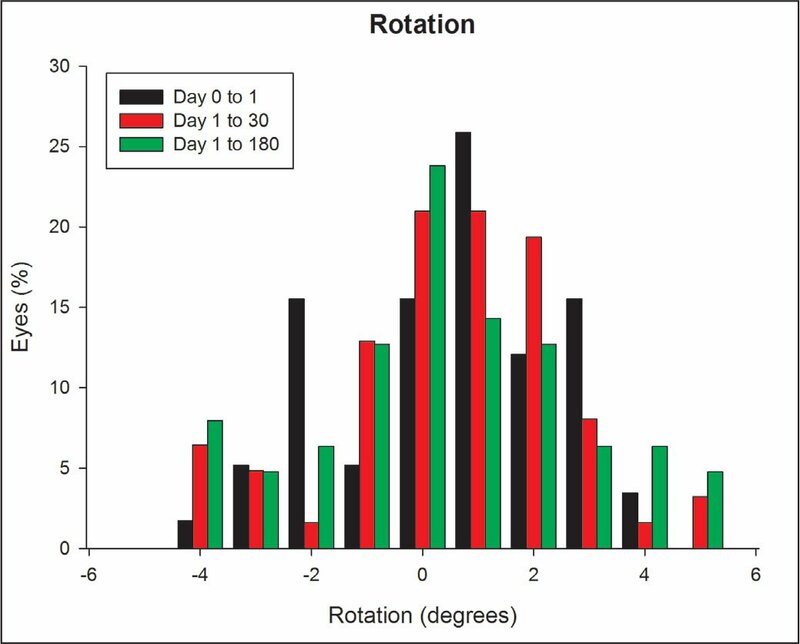 Absolute values for rotation postoperatively were 1.60° ± 1.13° at 1 to 3 days, 1.58° ± 1.36° at 30 days, and 1.83° ± 1.44° at 90 to 180 days. No lens rotated more than 5°. The average centration relative to the limbus was −0.04 ± 0.25 mm horizontally and 0.04 ± 0.26 mm vertically at 1 to 3 days, 0.00 ± 0.38 mm vertically and 0.01 ± 0.28 mm horizontally at 30 days, and 0.08 ± 0.37 mm vertically and 0.07 ± 0.47 mm horizontally at 90 to 180 days. The Rayner 600S IOL showed exceptional rotational stability and centration after implantation, meeting the U.S. Food and Drug Administration prescribed American National Standards Institute standards for toric IOLs. Rotational stability is essential for a toric intraocular lens (IOL) to adequately correct corneal astigmatism. It is estimated that approximately 22% of cataract surgery candidates exhibit corneal astigmatism exceeding 1.50 diopters (D).1 Uncorrected astigmatism reduces visual acuity and increases spectacle dependence, which may reduce quality of life2 and ability to undertake daily tasks3 and potentially increase economic costs.4 Correcting astigmatism at the time of surgery removes the problem of meridonal magnification caused by spectacle astigmatic correction, which distorts shape and affects spatial perception.5 Surgeons may use corneal or limbal relaxing incisions6,7 to reduce postoperative astigmatism following cataract surgery or implant a toric intraocular lens (IOL). Correction of corneal astigmatism relies on a predictable corneal healing response, but this can often be variable, particularly with high levels of astigmatism.8 Toric IOLs may thus offer a potentially more stable correction of astigmatism when correctly positioned with minimal rotation. Digital imaging has previously been applied to toric IOL rotation, but has been limited by image quality13 and has not compensated for eye or head rotation between consecutive visits.14,15 Any eye or head rotation during photography can lead to overestimation or underestimation of IOL rotation and thus must be compensated for. To do this, the use of anatomical markers such as iris features or conjunctival vessels is recommended.12 The American National Standards Institute guidelines for toric IOL rotational stability specify that 90% of eyes should be in the order of 5° or less on visits at least 3 months apart. 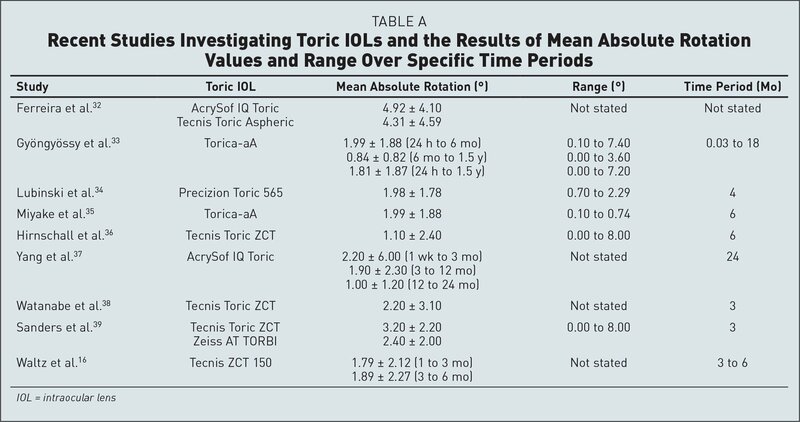 Currently only the Tecnis IOL (AMO, Abbott Park, IL) has been shown to meet this standard.16 The purpose of the current study was to determine the rotational stability and centration using objective image analysis of a new toric lens design platform. For the study, 66 healthy patients (mean age: 69.92 ± 8.45 years, 42 women and 24 men) were implanted with the monofocal Rayner 600S IOL (Rayner, Worthing, United Kingdom) in one eye only. All participants were recruited and examined at the Queen Elizabeth Hospital (University Hospitals Birmingham NHS Foundation Trust) in Birmingham, United Kingdom. The 600S IOL is an aberration neutral lens formed of a hydrophilic material based on the existing C-flex design by Rayner. It has an optic diameter of 6 mm and a 360° square edge on both the anterior and posterior surfaces supported by C-loop haptics. The lens optic also features engraved markings to assist stability measurement (Figure A, available in the online version of this article). The 600S intraocular monofocal lens (Rayner, Worthing, United Kingdom) with engraved lines to aid rotational alignment. Inclusion criteria for the study consisted of patients older than 40 years recommended for routine cataract surgery with otherwise clear media and healthy eyes who exhibited less than 1.50 diopters (D) cylinder of astigmatism. Exclusion criteria comprised previous ocular surgery or trauma, ocular inflammation, age older than 85 years, binocular vison anomalies, amblyopia, and insufficient physical or mental conditions to allow participation. The study conformed to the tenets of the Declaration of Helsinki and was approved by the ethical committees of both Aston University and the University Hospitals Birmingham Trust. Routine phacoemulsification and IOL implantation was performed by the same surgeon (SK) for all recruited patients after receiving informed consent. All surgeries were uneventful with no intraoperative complications. Following surgery and implantation, postoperative photographs were taken using the Keeler Symphony digital slit lamp (Keeler Ltd, Windsor, United Kingdom) of the lens in situ. Photography took place 1 hour after surgery and on follow-up visits conducted at 1 to 3 days, 30 days, and 90 to 180 days postoperatively. Maximal dilation was required for imagery and was achieved using 1% tropicamide and 2.5% phenylephrine at each visit. No significant postoperative complications were encountered other than mild posterior capsular opacification in two participants at the 180 day visit, but this did not affect imaging. All images were photographed at a magnification of ×10 using retroillumination and analyzed using specialist software (Labview; National Instruments, Austin, TX). Rotation and centration were determined for each postoperative visit (Figure 1A). The axis of IOL rotation was measured by drawing a line adjoining the two IOL orientation markings. Head and eye rotation was then compensated for by comparing this to the axis of a line drawn joining two consistently visible iris features or conjunctival vessels (Figure 1B). Anatomical markers were carefully chosen to ensure visibility on each photograph throughout the follow-up period. The angle between the two lines determined the axis of alignment at each time point and was compared to that of each visit to determine rotation. To measure IOL centration, the center of a circle circumscribing the IOL optic edge, pupil margin, and limbus were compared12 (Figure 1C). Image analysis for rotation and centration. 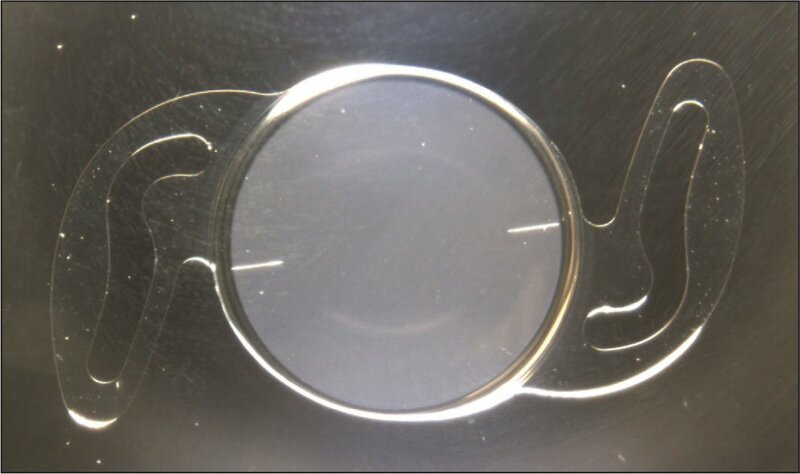 (A) Original image of intraocular lens in situ, circumference of lens, and engraved markings clearly visible. (B) Line drawn joining engravings and separate line drawn joining two clearly visible conjunctival vessels. The angle between these lines is measured and compared at each visit to determine rotation. (C) Circle drawn to circumscribe the lens optic edge and one to circumscribe the limbus. Centers are compared for each visit to determine centration. Rotation stability and IOL centration were assessed at each follow-up visit by subtracting from the values obtained at 1 to 3 days. The data were found to be normally distributed using a Kolmogorov–Smirnov test (P > .05) and therefore repeated measure analysis of variance was used to examine differences between visits. Surgery was uneventful with no intraoperative complications. Average monocular CDVA improved from 0.50 ± 0.28 logMAR (range: 0.00 to 1.47 logMAR) preoperatively to −0.02 ± 0.05 logMAR following surgery. Preoperative and postoperative manifest refraction were performed by the same clinician. The mean pre-operative spherical equivalent was 2.56 ± 2.23 D and improved postoperatively to a reduced mean spherical equivalent of 0.46 ± 0.34 D.
Mean rotation at each follow-up visit is shown in Figure 2. The average rotation was −0.03° ± 1.97° (absolute values: 1.60° ± 1.13°) from immediately after surgery to 1 day, 0.04° ± 2.09° (absolute values: 1.58° ± 1.36°) from 1 to 30 days, and −0.10° ± 2.34° (absolute values: 1.83° ± 1.44°) from 90 to 180 days. No clinically significant difference was found in rotation between visits (F = 0.041, P = .960). Rotation (degrees) of the 600S intraocular lens (Rayner, Worthing, United Kingdom) at each postoperative visit. Minus signs indicate anticlockwise rotation but, as can be concluded from the average rotation results, no real bias was found in the direction of rotation with the IOL. 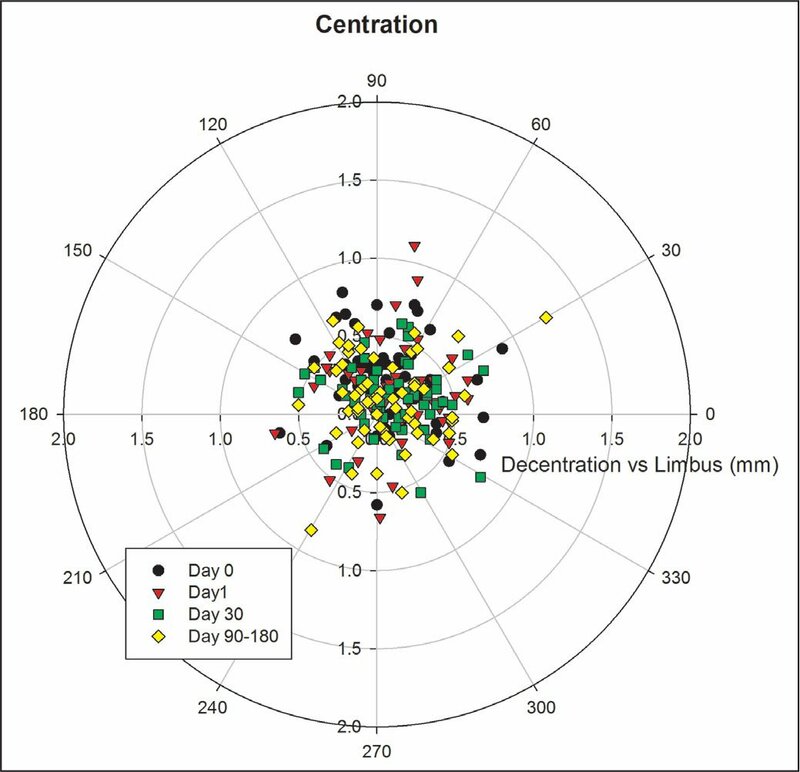 The average centration relative to the limbus after surgery was −0.04 ± 0.25 mm horizontally and 0.04 ± 0.26 mm vertically at 1 to 3 days, 0.00 ± 0.38 mm vertically and 0.01 ± 0.28 mm horizontally at 30 days, and 0.08 ± 0.37 mm vertically and 0.07 ± 0.47 mm horizontally at 90 to 180 days. Data show average centration to be relatively minimal and hence stable. Negative numbers here indicate temporal or superior displacement. Decentration (Figure 3) at each stage remained within 0.5 mm. Vertical decentration at 1 to 3 days was 0.04 ± 0.26 mm vertically and −0.04 ± 0.25 mm horizontally. This reduced to 0.00 ± 0.38 mm vertically and 0.01 ± 0.28 mm horizontally at 30 days, and 0.08 ± 0.37 mm vertically and 0.07 ± 0.47 mm horizontally at 90 to 180 days. Generally, decentration remained inferior and nasal but showed no significant change from immediately after surgery to 90 to 180 days (F = 1.872, P = .136) and was similar in magnitude horizontally to vertically (F = 3.474, P = .067). Decentration of the 600S intraocular lens (Rayner, Worthing, United Kingdom) at each postoperative visit. At least one-quarter of patients undergoing cataract surgery have the potential to benefit from toric IOLs.1 The stability of toric IOLs has long been of concern to surgeons due to their susceptibility to rotate after implantation. In cases of significant deviation from the axis of correction, surgical repositioning is required, which must be performed within 1 month after implantation. Studies have reported significant rotation in the range of 10% to 67% with toric IOLs.17–19 However, not all studies correct for cyclorotation of the eye or head tilt, which will affect results. Various anatomical features may affect rotational stability (eg, capsular bag size19 and longer axial length20). In the current study, average axial length was measured as 23.38 ± 1.47 mm (range: 20.93 to 27.40 mm) with a correlation coefficient value of 0.02 (P > .05) and so was unlikely to have an impact on the small rotation reported. Aspects of IOL design such as haptic type can also influence stability. Plate haptics in general have shown better long-term stability, but exhibit greater rotation in the early postoperative period compared to loop haptics.21–24 Newer designs have been introduced to provide mini-loop and Z-haptics to provide better stability.11,25,26 It is thought the plate haptic design of the 600S may have contributed to its high level of stability within the study. Previous studies have assessed toric IOL rotation subjectively, often through slit-lamp beam protractors or graticules within eye pieces of slit-lamp biomicroscopes.15,25,29 However, stable head and eye position is vital for accurate measurements. Separate mounted cameras15 can also introduce another source of error in rotation measurements, but this can be eliminated through the use of integrated cameras in digital slit-lamp biomicroscopes. Subjective techniques may only estimate rotation to the nearest 1° to 5°.12 The form of objective analysis used in the current study has been shown to have repeatability of 1° for rotation, 2° for head rotation, and 0.1 mm for centration.12 However, image quality is paramount because poor pupil dilation and fibrosis in later stages may obscure the view of toric markings. Sufficient mydriasis may present as a particular difficulty in older populations and was a significant limitation in the study. Simultaneous imaging of the iris or conjunctiva and toric engravings required increased illumination, which resulted in some patient discomfort and squinting, hence obscuring the toric markings. Emerging technologies to assess rotation include optical coherence tomography, which has been demonstrated as a potential aid for aligning toric IOLs and measuring postoperative rotation.38 Although this method can both assist IOL alignment and evaluate rotational stability, it is limited by the requirement to obtain simultaneous images of the iris and corneal topography and cannot compensate for errors due to IOL decentration or tilt. It is also reliant on marked characteristics in the mid-peripheral iris, unlike the technique in the current study where reference points at any location on the iris can be used. Pronounced senile rings in the elderly could thus pose an issue with optical coherence tomography. The use of biological markers is also supported by Sanders et al.,39 who reported ease and precision while compensating for head and rotation using similar photography methodology. The objective analysis implemented proved to allow sensitive measurement of stability while adequately compensating for factors that could influence results. Rotation of the 600S IOL was minimal across the visits and never exceeded 5° at any point; the C-loop haptic design may have contributed this. Centration was also stable after implantation. The Rayner 600S IOL has thus shown to be an ideal platform for toric correction meeting the U.S. Food and Drug Administration prescribed American National Standards Institute guidelines for toric IOL rotational stability. Grabow HB. Toric intraocular lens report. Annals of Ophthalmology and Glaucoma. 1997;29:161–163. Bylsma S. The STAAR Toric IOL: current technique and results with a plate-haptic lens that effectively neutralizes corneal astigmatism at the time of cataract surgery. Cataract & Refractive Surgery Today. 2006:74–76. Grohlich M, Miháltz K, Lasta M, et al. Evaluation of postoperative astigmatism correction and postoperative rotational stability of two toric intraocular lenses [article in German]. Klin Monbl Augenheilkd. 2017;234:796–804. Gyöngyössy B, Jirak P, Schönher U. Long-term rotational stability and visual outcomes of a single-piece hydrophilic acrylic toric IOL: a 1.5-year follow-up. Int J Ophthalmol. 2017;10:573–578. From Aston University, School of Life & Health Sciences, Ophthalmic Research Group, Birmingham, United Kingdom (GKB-B, ALS, JSW); and the Department of Ophthalmology, University Hospitals Birmingham NHS Foundation Trust, Birmingham, United Kingdom (GKB-B, SK). Supported by Rayner Intraocular Lenses Limited, Worthing, United Kingdom.